Sometimes in life you’re just in the right place at the right time, when you step up, ya’ pays ya’ money and ya’ takes ya’ chances. Sometimes you’re lucky, but many times you’re not. I have a saying in life that you gotta just keep turning over rocks until you find a crawdad. 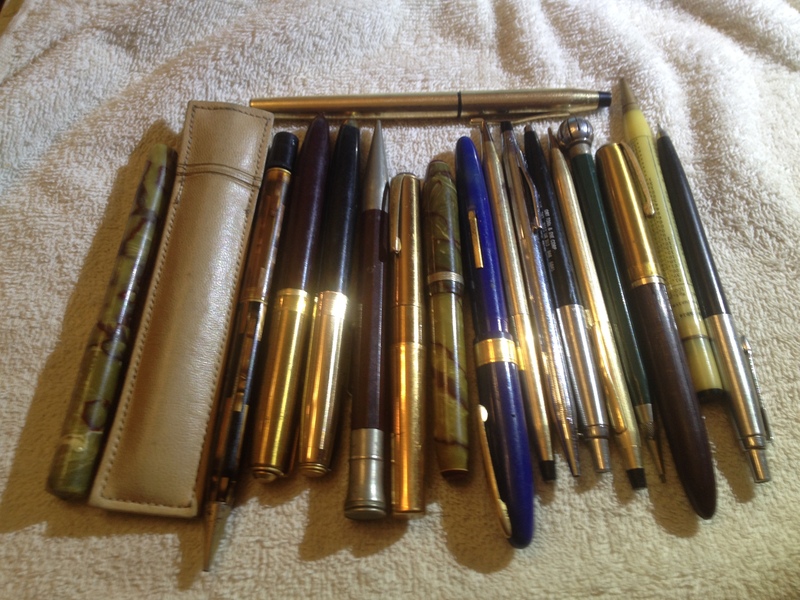 As I began to get deeper into fountain pens, especially on the restoration side, I came across an EBay auction not long ago that contained one fuzzy, out-of-focus picture much like the one shown below of 15 or twenty pens up for sale. There was much discussion in a thread over on Fountain Pen Network about this particular lot. I took a chance on this lot of stuff for $49.00 shipped to my front door. What I found amongst the rubble (not shown in the picture above) were these: 1) a near mint Parker 51 that I will detail for you and restore in an upcoming blog post, 2) a near mint, but more importantly a true DuoVac/VacuFold in a blue striated color with the proper vacumatic clip, but with the pen body made from Duofold material, a pen which I will also restore for you in a future blog post, and 3) a near-mint green striated Conklin Nozac from the 1930’s or so that we are going to talk about today. 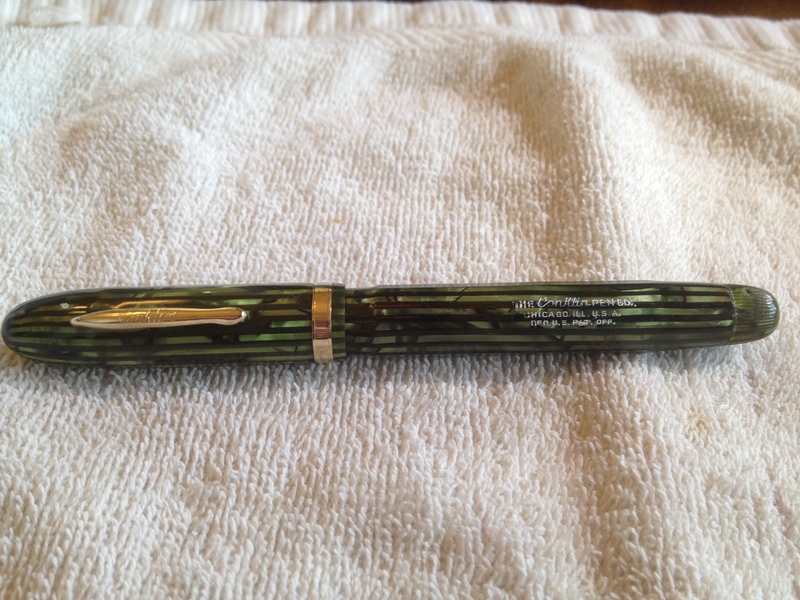 As you can tell from the pictures it is truly a beautiful pen, but it was unlike anything I had come across before. The pen has a collapsing piston mechanism similar to what Pelikan had been using, but the blind cap was held onto the pen in such a fashion that made the disassembly and restoration a degree or two of difficulty higher than that of an Aerometric Parker 51, for example. The blind cap was held in place by a tiny pin rod that entered one side of the blind cap and ran through the center of the piston drive pin. If the piston will move at all, the traditional restoration technique on the Conklin Nozac is to remove the section from the pen (it screws out with the help of a little dry heat) and then turn the blind cap to run the piston all the way toward the front of the barrel. Tradition holds that at this point you’re supposed to give the internal piston a brisk counter-clockwise twist which will remove it from the inner shaft allowing you easy access to the dried cork seal without having to remove the inner shaft or blind cap. Unfortunately, this method did not work for me. I could not get the piston and old seal out. Instead I used a 1.17mm drill in a pin vice to drill a hole in the blind cap on the exact opposite side of the pin I could see. I then used the blunt end of a .97mm drill as a pin punch to remove the blind cap from the end of the barrel and piston mechanism , leaving three washers and the pin. Once I had access to the piston mechanism I used a 3/32″ brass rod to push it from the rear of the pen through the section after it had been removed. The third photo below is what I found, except that the old cork piston washers were completely hardened. They chipped away from the shaft with a sharp pick quite easily. 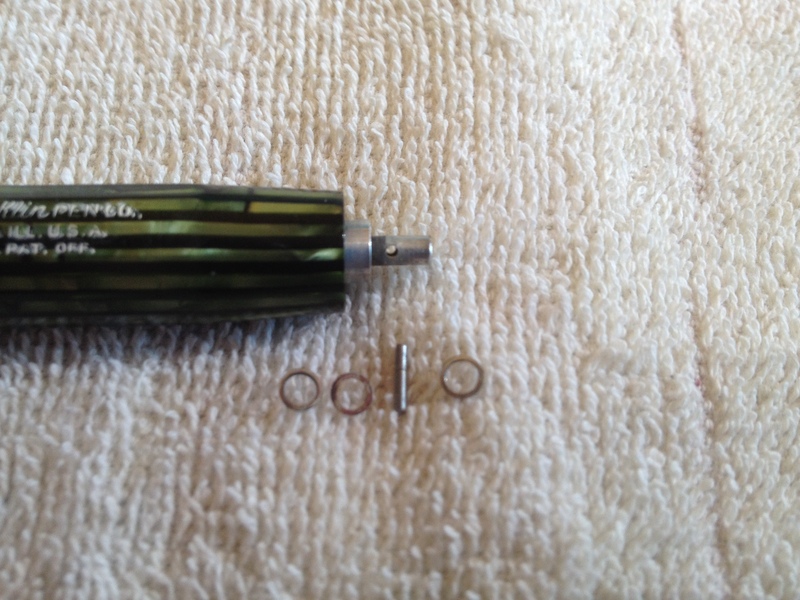 I used two sized “C” replacement washers from the Conklin Nozac Repair Kit over at David Nishimura’s site Vintage Pens. They have a lot of great supplies and information over there and in the interest of full disclosure I have no affiliation with them whatsoever. This entry was posted in Conklin Nozac, Restoration & Service and tagged conklin, conklin fountain pen restoration, conklin nozac, conklin nozac fountain pen, conklin nozac fountain pen service, conklin nozac pen, conklin nozac pen service, conklin nozac repair, conklin nozac restoration, conklin nozac service, conklin pen repair, conklin pen restoration, conklin pen service, conklin repair, conklin restoration, conklin service, fountain pen restoration, green striated conklin nozac, green striated nozac, nozac, nozac repair, nozac restoration, nozac service, triumph vintage pens, triumphvintagepens. Whoa! Stop, You’re Still In The Right Place!